One of the most fun anime series ever! 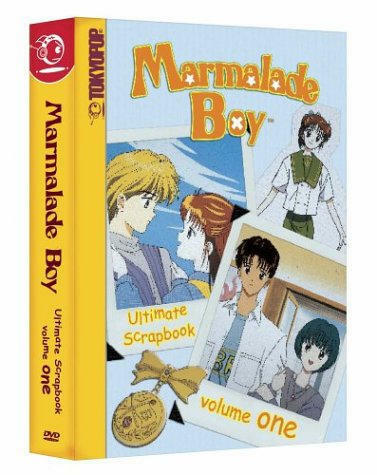 Marmalade Boy is one show I never thought would be released in the States--thankfully I was wrong. It's as shoujo as any anime out there, though it has plenty of humor and "I remember what that was like" to pull in almost everyone. The story revolves around two main characters: Miki Koishikawa and Yuu Matsuura. Both are second year high school students (equivalent to 11th grade in the States). The story begins with Miki sitting down to tea with her parents. As she starts drinking her tea, Miki's parents tell her they are getting divorced, but they are a bit too cheerful about it. In shock, Miki listens as her parents explain that they met another couple on their recent trip to Hawaii, fell in love with their opposites in the other couple, and decided to get divorce, swap partners and remarry! Needless to say, Miki is very surprised, but it doesn't stop there: Miki's parents continue, saying that they don't want her to be deprived of either of them as a parent, so they are going to all rent a big house with the other couple and all live together. A day or so later, Miki and her parents have dinner with the other couple, and as the meal is starting, their son, who happens to be the same age as Miki, comes in--it's love at first site. From there, the story continues for 76 episodes, though only the first 19 are contained in this 3-disc set. The story is very well written (based on the manga of the same name by Yoshizumi Wataru) and pulls you along for a ride you can't help but enjoy. Now, I only have two complaints about the box set. First, my major complaint is about how the sound during the opening and ending credits is reminiscent of what you'd hear if you were singing in a tunnel: it's very distant, tinny, and hollow. Whoever mastered it did a horrible job on that part. My minor complaint is regarding the translation of some parts. Several times the translator(s) greatly escalated the meaning of a mild exclamation into an unneeded expletive. The translator(s) weren't consistent, either, translating the same word (chikusou) into variations from "heck" to "crap". Now, a lot of translation relies on nuance of how something is said, but the translator(s) here weren't consistent from situation to situation. Because of these flaws, I give this set only a B+ rating. That said, they did an overall decent job on the release. The picture quality was excellent, and I noticed only a few minor artifacts--fairly common for animation--most people probably won't even notice them. The subtitles are timed well, and the packaging is very sturdy and well made. There's even a collector's...card, I guess you would call it. It looks like something that would match with cards from the other releases to form a larger picture. If you like shoujo anime, then you'll love this series. If you haven't ever watched anime, let alone shoujo anime, then you may want to rent or borrow this before buying it. Marmalade Boy definitely isn't for everyone, but it's an excellent beginning series to show just how fun a series can be. The series is definitely an A+.